Here I go again with another exclusive behind-the-scenes look at a star-studded event that wasn’t televised. I did some Googling and am confident that this detailed write-up isn’t published anywhere else. Other media outlets may have been present and spoken with the stars on the red carpet but no one has a backstage report like this one (there’s even a description of the dinner menu!) from one of my sources. The writer also took all the photos so they’re exclusive as well. Since the account is rather comprehensive, I’ll publish this in two parts. Read on for fun anecdotes about Hugh Laurie, Don Cheadle, Sean Penn and Tilda Swinton! Although all of the ingredients for a glamorous Hollywood awards show were present (celebrities, the “Academy”, awards and such), Thursday night’s British Academy of Film & Television’s Los Angeles annual awards show was everything but typical. 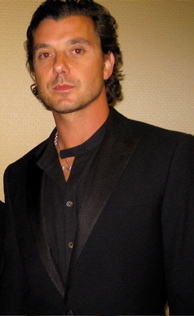 Held at the Hyatt Century Plaza Hotel on November 6, 2008, the annual awards show had only three awards and was not televised. Beginning with a modest red carpet, pre-reception and a VIP after-party, the star-studded event honored director Stephen Frears and actors Don Cheadle, Tilda Swinton and Sean Penn. Each award was preceded by back-to-back presenters (including Annette Bening, Jack Black, and Patricia Clarkson) and tributes. As guests arrived on the secondary ballroom level, they were segregated into two groups: celebrities and non-celebrities. The non-celebrities were to attend a silent auction and pre-reception while the celebrities were escorted to the red carpet. If there was a theme to the event, it would be “arriving sans partner.” Bening came sans Warren Beatty, performer Gavin Rossdale arrived without Gwen Stefani, Sean Penn was without on-again, off-again spouse Robin Wright Penn, and presenter Ben Affleck arrived without wife Jennifer Garner. Celebrities were escorted off the carpet into a small room where candid photos were taken. This was where celebrities caught up with each other. Swinton chatted with Bening, and Penn greeted me saying, “It is SO good to see you again.” (I had just seen Penn a couple of weeks before at another event.) Here was also an opportunity for a quick drink prior to entering the show. Penn’s assistant for the evening offered Penn another drink. As honorees Penn, Swinton, and Frears were escorted to the main ballroom, guests started pouring in. About twenty minutes later, Affleck, Cheadle and presenter Eddie Izzard were seen being wrangled as a group to exit the press area and go directly to the show. At 8 p.m., a salad was served, followed by an entree of Chicken Wellington wrapped in puff pastry and ending with lemon white chocolate sponge cake. Plenty of wine and spirits were provided. The third award of the night went to Tilda Swinton, who was honored with the Britannia Award for British Artist of the Year. The presenters were Angelica Huston and Hugh Laurie, who shared anecdotes. 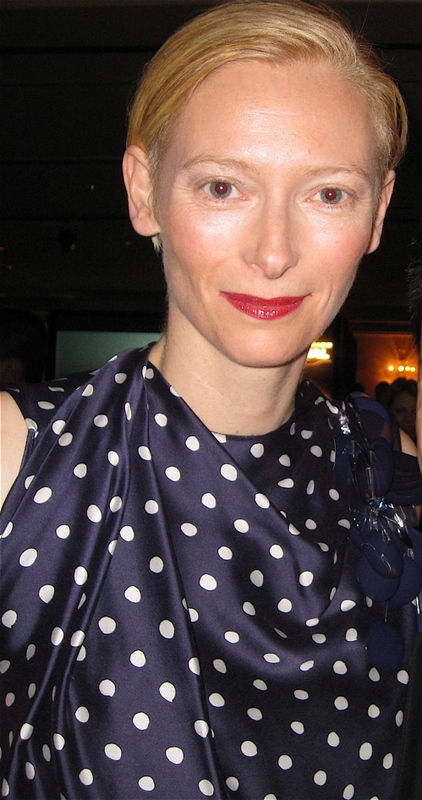 Overwhelmed, Swinton accepted the award and shared that it has only been recently that she has basked in the awards spotlight. “The only thing I’ve won prior to these types of acting awards was a raffle at the age of twelve. I won Pagan Man aftershave that I re-gifted,” said Swinton. Check back tomorrow for Part Two, which includes a gushing tribute to Sean Penn.